It was a revolutionary year when Youtube came out and gave us something we couldn't even think of. The biggest video database in the world, full of music, free for everybody and the best source of getting who's hot, what's new and what is actually going on in the world of music. It's difficult to think of something you can't find on Youtube – from old memes, to full albums to live concerts from best music festivals – everything is in one place. We can share everything, regardless if it's a cover, piano tutorial of just a video with lyrics and an MP3 song on a background. That's why we love Youtube. You know why we don't always love Youtube? Because, as I said, it's a video resource's a video resource. Officially, you can't download a video or rip tracks from a video (only if you use special software). Yet, people are still struggling to convert youtube to MP3 to be able to listen to full albums for free. Since most streaming services work via paid subscriptions, Youtube remains one of few free streaming services. However, to listen to music you don't necessarily have to convert youtube to MP3, but use an audio player for Mac that streams only music without video. Some apps that offer Youtube streaming are too expensive (on average $10 per month). Others violate Youtube's Terms & Conditions, but today I will reveal an easy and legal way to convert Youtube to MP3 on Mac. And again, Youtube is a video service, don't expect to find Hi-Res audio there. All videos are in a bad quality at 128 kbps WebM. When you convert youtube to MP3, you reduce the sound quality even more, and there's nothing left from the original recording. Only the melody. Converting Youtube to MP3 on Mac, especially a long video like some DJ's live set takes lots of time. So why should you be waiting for five minutes to convert a video and then another five to download converted MP3? That's called bad time management. How to convert Youtube to MP3 on Mac and not waste time or destroy the sound quality? VOX is a unique audio player that features this very service we are talking about here - Youtube streaming. VOX is fast, easy to use and very convenient. VOX doesn't work like typical Youtube to MP3 converters, but streams directly from Youtube. You don't download, wait for the conversion to finish or whatever. You just listen. How does VOX Music Player work? When you open the player, press CMD+U and a small window will pop up. Then paste a Youtube video link and press 'OK.' The audio track will appear on your Playlist and start playing automatically. This feature allows you to combine your local library with music from Youtube to make individual playlists consisting of your favorite tracks. 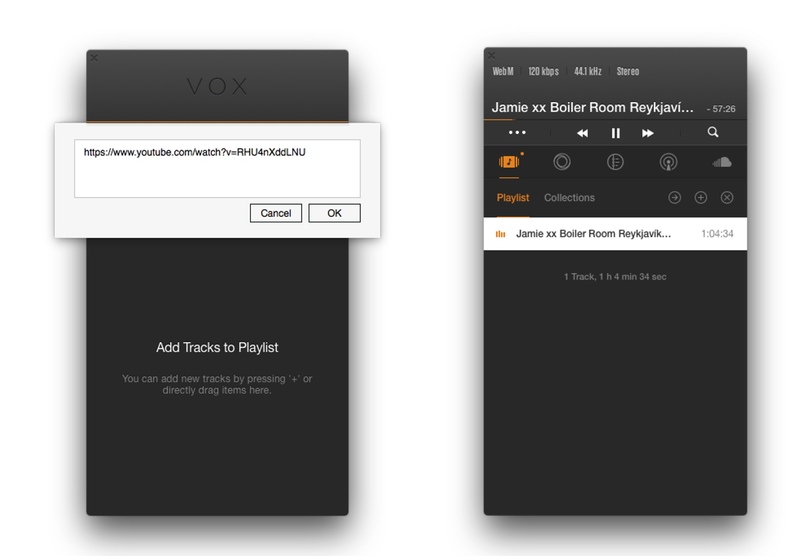 This feature is available only for VOX Player for Mac. 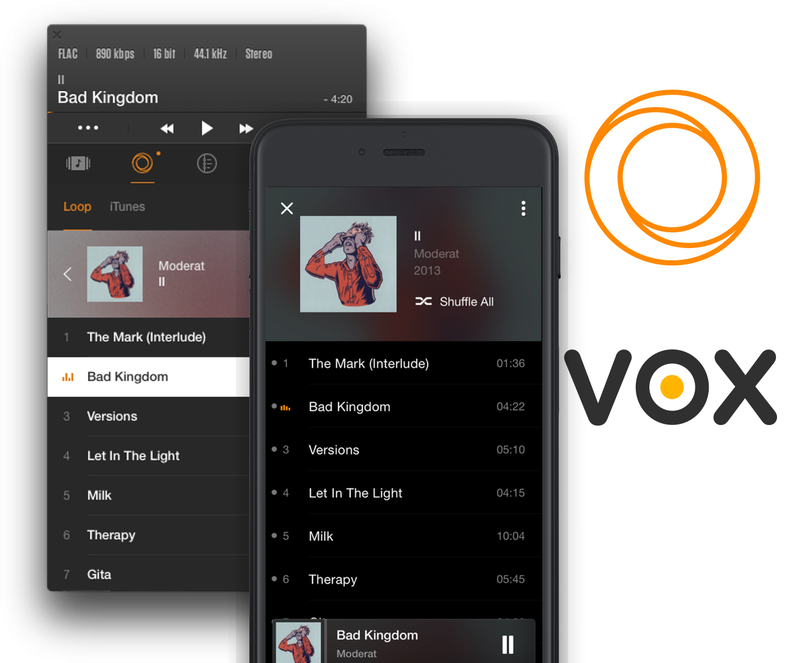 VOX Music Player emphasizes the quality of the sound. VOX can play a vast range of audio formats (both lossy and lossless). It includes some of the best sound-boosting features like EQ and BS2B technology. An improved bass technology makes you experience a whole new level of sound. This is true Hi-Res music. Also, VOX Player has its own online music storage called VOX Cloud (a part of VOX Premium account). VOX Cloud is an unlimited music cloud where you can store all your music. VOX Cloud (formerly LOOP Unlimited Music Cloud Storage) syncs all your Apple devices, so your music libraries on, for instance, Mac and iPhone are same. That's a great way to listen to Hi-Res music on iPhone if you lack space or have a big collection of audio files in formats not supported by iPhone (FLAC, DSD, PCM etc.). Also, for the times you don't have Internet data you can download your tracks or albums for offline listening. Since VOX was created for music lovers by music lovers, it focuses the playback, has an unobtrusive design and is free of ads. Plays lossy and lossless audio formats. Syncs your Spotify and SoundCloud accounts. Scrobbles to Last.fm to keep your listening stats. Has over 30,000 radio stations. Features EQ and BS2B technology. As you can see, you don't have to convert Youtube to MP3 on Mac when you use VOX Music Player. Copy, paste and listen to your favorite tracks from the biggest music database on Earth. Among all the ways of listening to Youtube without videos, the most convenient one is using VOX Music Player. Add the tracks to your playlists, mix them with your local library, SoundCloud and Spotify collections and enjoy the music with no conversion. Enjoy the chills with VOX!